Vancouver, B.C. – August 14, 2013 – TAG Oil Ltd. (TSX: TAO) and (OTCQX: TAOIF), reports the Company has filed its financial results with the Canadian Securities Administrators for the Company’s June 30, 2013 first quarter fiscal 2014 year. Copies of these documents can be obtained electronically at http://www.sedar.com, or for additional information please visit TAG Oil’s website at https://tagoil.com/. At June 30, 2013, the Company had cash of $57.2 million, working capital of $63.5 million and no debt. Production revenue increased to $14.7 million. Net income of $4.5 million generated, before the deduction of non-cash share-based compensation. Operations generated $9.6 million in cashflow. Daily average production increased 39% in Q1-14 compared to Q4-13. Purchased 260,000 common shares of the Company for cancellation and return to treasury at an average price of $3.05 per share. Drilled and cased the Ngapaeruru-1 well in the East Coast Basin, intersecting 155 meters of unconventional oil and gas reservoir in the source rock. Signed a new surface access agreement in the East Coast Basin permit to allow for drilling access on PEP 38348 (Waitangi Hill area). TAG currently has 59,196,752 common shares outstanding and 62,905,086 common shares outstanding on a fully diluted basis. During the remainder of the 2014 fiscal year TAG will execute the most diverse and active exploration drilling campaign in the Company’s history. This high-impact drilling campaign includes nine conventional wells across three new permits with partner East West Petroleum, plus a minimum of two 100% TAG owned deep Kapuni Formation wells (“Cardiff and Heatseeker”) in the Taranaki Basin, and at least one unconventional well in the East Coast Basin (TAG 100%). Consistent with our corporate strategy, this drilling program will be funded from cash flow provided from TAG’s Cheal and Sidewinder production and a strong, debt-free balance sheet. TAG’s new Taranaki region production and delivery infrastructure ensures efficient and cost-effective commerciality of any new wells that arise from this drilling program. A summary of the resource potential limited to the twelve prospects included in this drilling program are described below. The Company expects to continue to identify additional resource potential through new lead and prospect generation as analysis of the permit data continues. 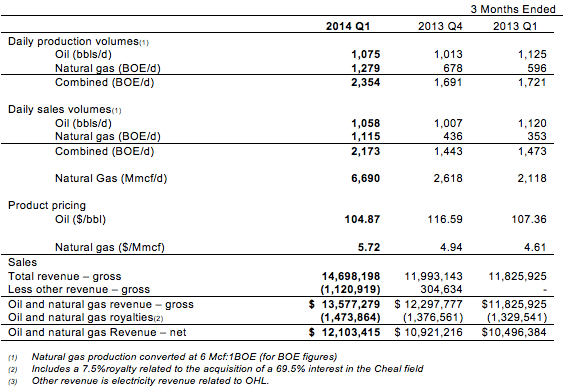 TAG Oil will host a discussion of its Q1 2014 financial results and forward program on Wednesday August 14, 2013 at 1:00 pm Pacific Time. Please call in ten minutes before the conference call starts and stay on the line (an operator will be available to assist you should you have questions of management during the call). In addition questions can be forwarded by e-mail in advance to info@tagoil.com. TAG Oil Ltd. (https://tagoil.com/) is a Canadian-based production and exploration company with operations focused exclusively in New Zealand. With 100% ownership over all its core assets, including extensive oil and gas production infrastructure, TAG is enjoying substantial oil and gas production and reserve growth through development of several light oil and gas discoveries. TAG is also actively drilling high-impact exploration prospects identified across more than 2,669,780 net acres of land in New Zealand. In the East Coast Basin, TAG is exploring the major unconventional resource potential believed to exist in the source-rock formations that are widespread over the Company’s acreage. These oil-rich and naturally fractured formations have many similarities to North America’s Bakken source-rock formation in the successful Williston Basin. The resource estimates in this news release were prepared with an effective date of June, 30, 2013. These estimates have been internally prepared by an internal qualified reserves evaluator in accordance with NI 51-101 and the Canadian Oil and Gas Evaluations Handbook. TAG Oil has adopted the standard of six thousand cubic feet of gas to equal one barrel of oil when converting natural gas to “BOEs”. BOEs may be misleading, particularly if used in isolation. A BOE conversion ratio of 6Mcf: 1 Bbl is based on an energy equivalency conversion method primarily applicable at the burner tip and does not represent a value equivalency at the wellhead. B. Those relating to TAG Oil’s exploration and development of its oil and gas properties within the Cheal and Sidewinder project areas, the production and establishment of additional production of oil and gas in accordance with TAG Oil’s expectations at Cheal and Sidewinder, well performance, drilling, the completion of new infrastructure at Cheal and Sidewinder, optimization, the increase of cash flow from new production, expected growth, results of operations, performance, prospects, evaluations and opportunities. While TAG Oil considers these factors and assumptions to be reasonable based on information currently available, they may prove to be incorrect. Actual results may vary materially from the information provided in this release, and there is no representation by TAG Oil that the actual results realized in the future will be the same in whole or in part as those presented herein. TAG Oil is involved in the exploration for and production of hydrocarbons, and its property holdings with the exception of the Cheal and Sidewinder project areas are in the grass roots or primary exploration stage. Exploration for hydrocarbons is a speculative venture necessarily involving substantial risk. There is no certainty that the expenditures incurred on TAG Oil’s exploration properties will result in discoveries of commercial quantities of hydrocarbons. 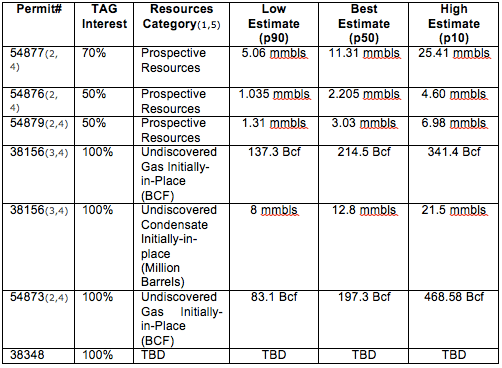 TAG Oil’s future success in exploiting and increasing its current reserve base will depend on TAG Oil’s ability to develop its current properties and on its ability to discover and acquire properties or prospects that are producing. 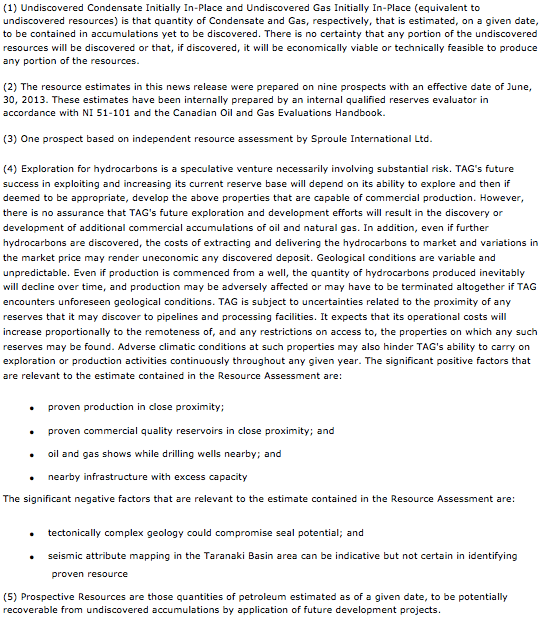 There is no assurance that TAG Oil’s future exploration and development efforts will result in the discovery or development of additional commercial accumulations of oil and natural gas.Other factors that could cause actual results to differ from those contained in the forward-looking statements are also set forth in filings that TAG and its independent evaluator have made, including TAG’s most recently filed reports in Canada under National Instrument 51-101, which can be found under TAG’s SEDAR profile at www.sedar.com. TAG undertakes no obligation, except as otherwise required by law, to update these forward-looking statements in the event that management’s beliefs, estimates or opinions, or other factors change.